For several weeks I’ve been trying to track down what I thought might be a strange new frog in the garden. 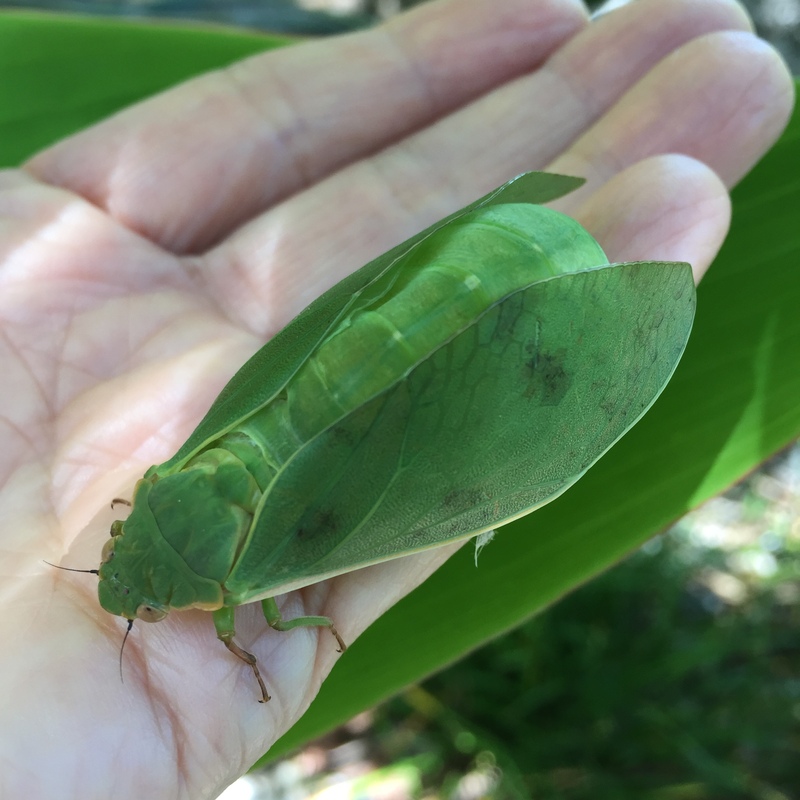 The discovery that the “frog like” sound was coming from a Bladder Cicada (charming name) has prompted me to re-post this lament from several years ago. 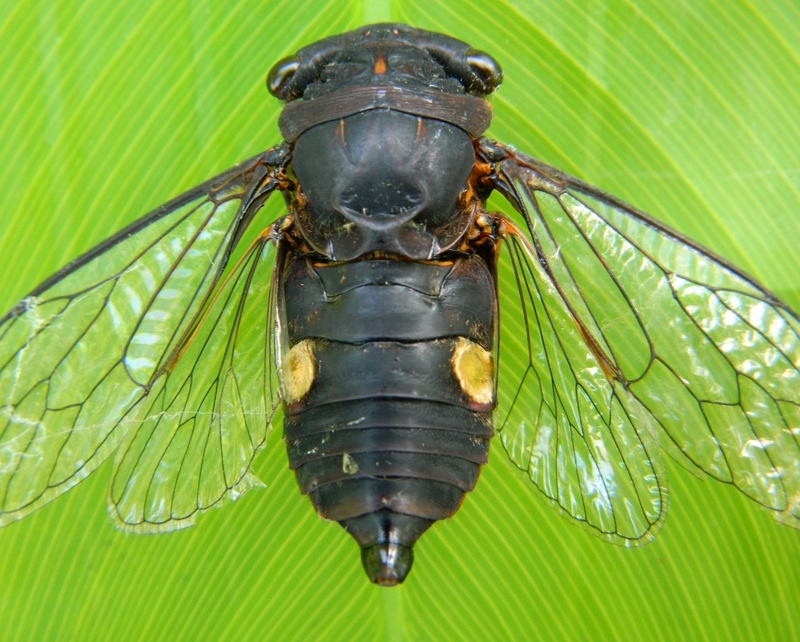 The Bladder Cicada uses its large hollow abdomen as an echo-chamber to amplify its mating call – as if cicadas need amplification! It’s not enough that I’ve discovered still more variations of cicada in the garden, now they’ve gone and organised themselves into shifts !! First the Dawn Shift which starts at five am and continues until six. So just when you think “ Thank God they’ve stopped” you realise that it’s time to get up. Then after one hour’s silence, the Day Shift starts. The Day Shift runs from seven am to six pm. 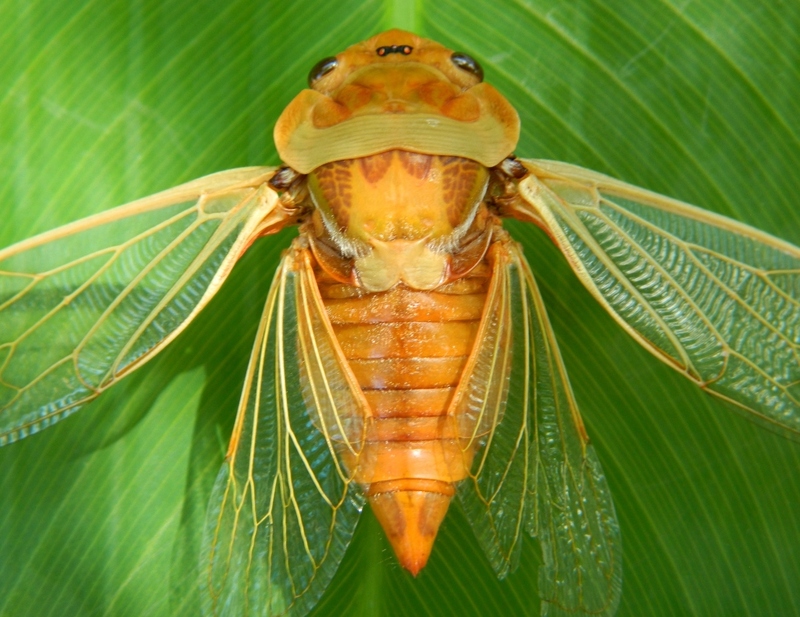 This is when all the species of cicada not already rostered on the Dawn, Dusk or Graveyard shifts, compete with each other in an attempt to send you troppo with waves of their ear-piercing calls. The Dusk Shift starts at six, just in time to drown out both the news and current affairs programmes on television. It stops suddenly at around eight, when the Graveyard Shift takes over for a few hours. The Graveyard Shift is the quietest of all, as dying cicadas crash into windows and lights, then fall to the ground on their backs and rotate like demented helicopters often uttering strange and un-nerving distress calls. I am a complete novice when it comes to fermenting Kombucha. But I decided to try making it myself after sampling several bottles of commercially produced and boutique organic Kombucha. I found them to be either overly effervescent, or the flavours not to my liking. So after consulting the internet, I decided to “give it a go”. And it’s fascinating – like having a small, well-behaved but slightly repulsive pet. 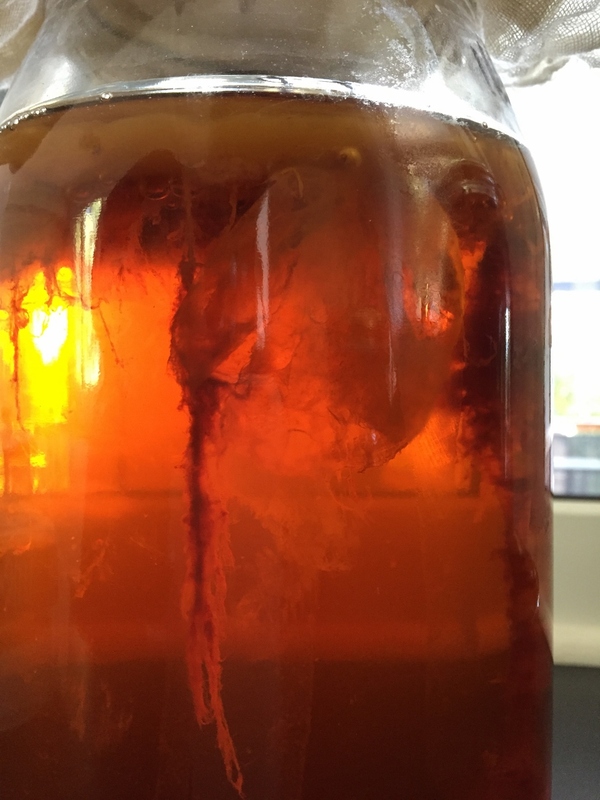 I managed to grow my own scoby, the hard way, from the dregs of a bottle of local organic Kombucha. It took six weeks, but it may well have taken less time if I hadn’t sniffed, prodded, poked and held it up to the light every day. 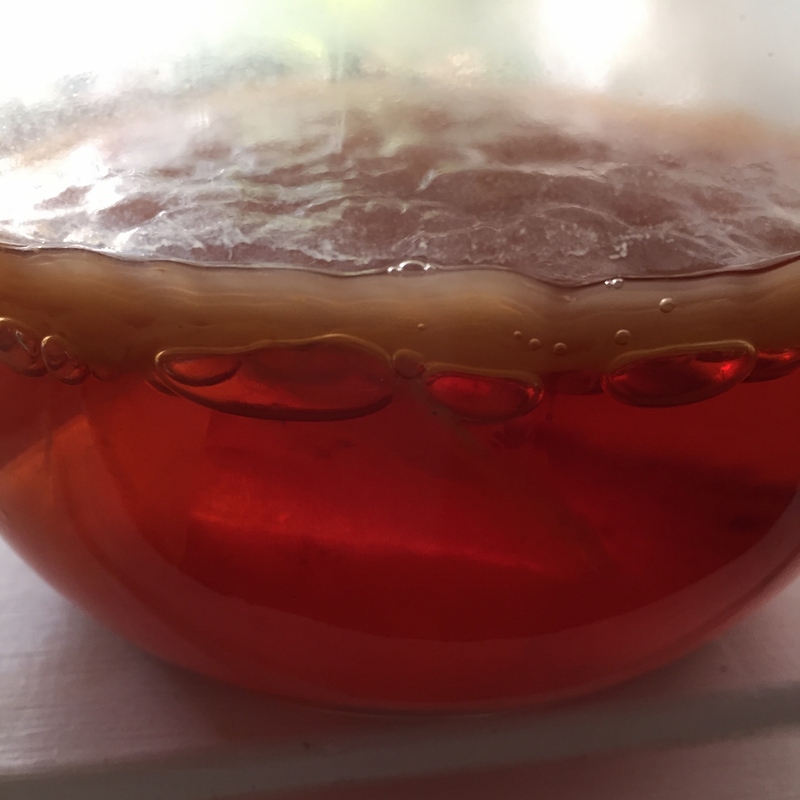 I probably didn’t give it enough sugar either, because once I added a little sugar syrup, the sad looking scoby perked right up, and within a few days “she” was blowing bubbles. So throwing caution to the wind, I made up my first big batch of sweet tea, let it cool and then slid the scoby into the jar. She promptly flipped on her back and sank like a stone. OMG – I’ve killed her! Consult the internet – apparently not a disaster, it happens quite often. After a couple of days she rose to the top of the jar and I was able to flip her back. Then she started growing all sorts of trailing appendages and dropping bits of sediment. Consult the internet again – apparently normal. I’m a bit dubious because “normally” something that looks like this would go in the compost. 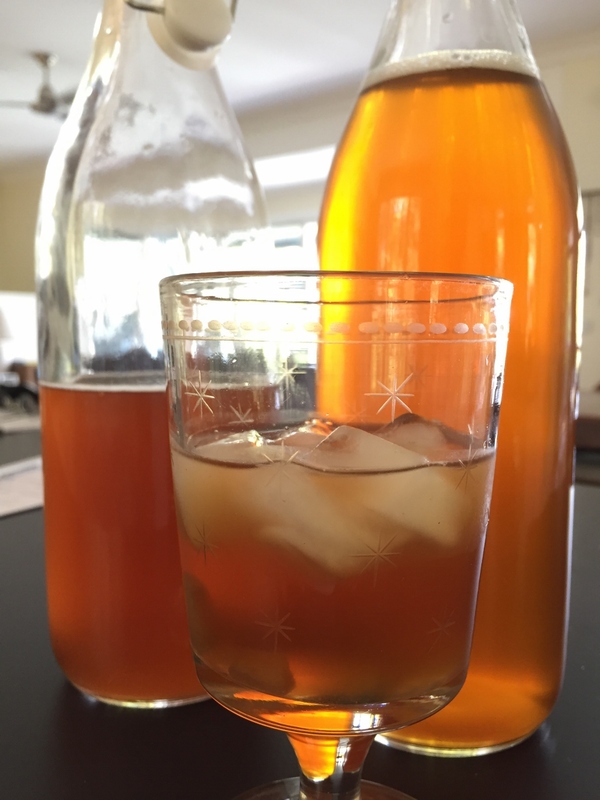 And then yesterday, on the seventh day of fermentation, I drank my very first glass of home-made Kombucha and it was delicious. Just a touch of sugar, a little effervescence, and a hint of black tea. Poured over ice cubes on a horrible, hot and windy 36 degree day, it really hit the spot. The start of another scoby? Here is a link to the website I used to get me started – she is very informative. I used the proportions: 1 litre filtered water, 2 organic black tea bags, 55g sugar, 100 ml of store bought organic Kombucha. I used the dregs from the bottom of the bottle. Once you have fermented your first batch, you can use 100 ml of that to start your next batch. Make sure you keep the scoby covered with cloth, and sterilise your jars and bottles by filling them with boiling water. Start tasting from the seventh day, when it should be slightly sour and fizzy. The longer you leave the scoby in, the more vinegary it gets. 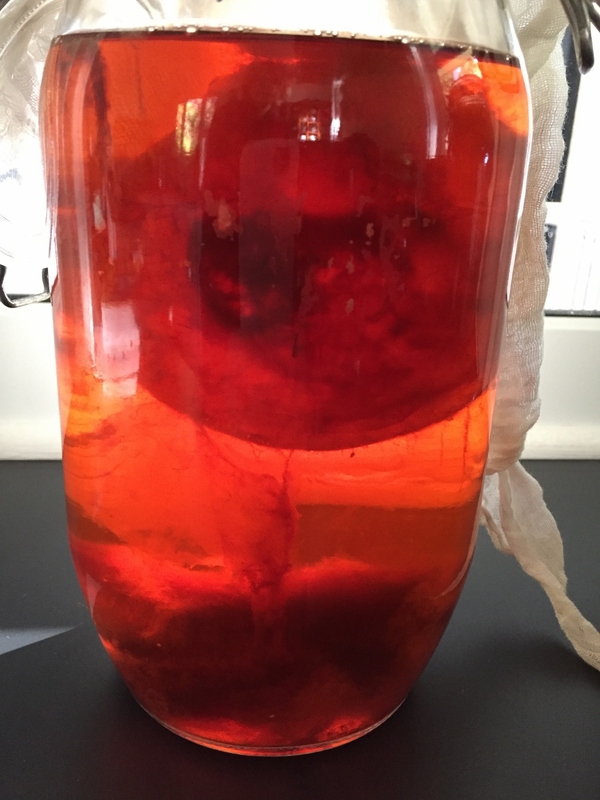 Finally, here is a link to a website which shows what your scoby should and should NOT look like. For the last week, my house has smelt like a sauerkraut factory. In fact, unless you are partial to the smell of boiled cabbage, the word you would probably use would be stink rather than smell. The aroma of stale boiled cabbage is NOT nice. 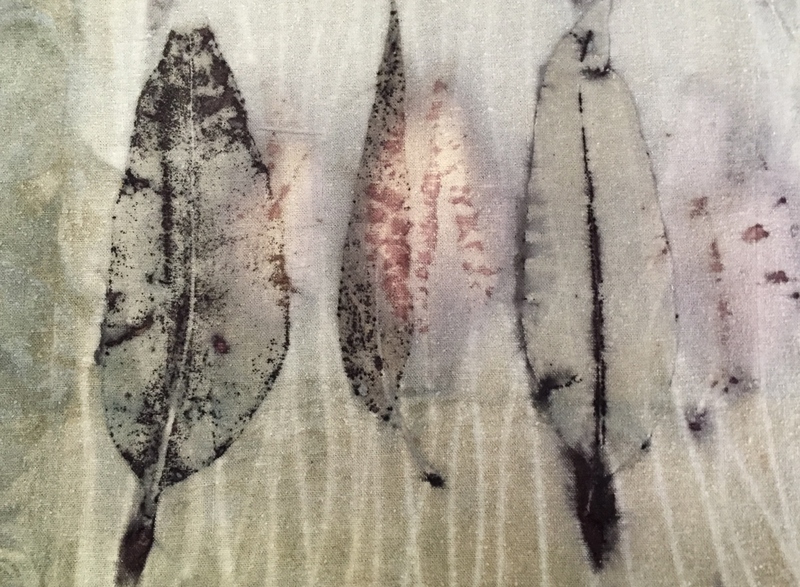 What was supposed to be a quick eco-dyeing experiment with Purple Cabbage, iron and eucalyptus leaves, turned into a week long obsession quite by accident. On discovering that I had run out of plain cotton fabric to insert between the layers of fabric and leaves, I decided to improvise by inserting sheets of ordinary copy paper before wrapping it around bamboo and simmering it in a pot of cabbage water and iron. So then of course I was hooked. I had to continue, with different weights of paper – 80gsm, 110gsm and 250gsm, and fresh leaves, dried leaves and leaves soaked in iron water. Endless possibilities. Every morning I bounded out of bed to see what unbundling suprises awaited me. But eventually, I had to stop, clear everything away, and simmer some citriodora leaves for a few hours to get rid of the stale cabbage aroma. I’ll be at it again as soon as I’ve caught up with my garden jobs. You will need a selection of sweet and sour citrus – orange, mandarin, cumquat, grapefruit, blood orange, lemonade fruit etc – this is a great way to use up ugly, misshapen or blemished citrus. Enough sugar syrup to fill the jars and cover the burnt citrus. There are plenty of recipes for sugar syrup on the internet. I used two parts sugar to one part water dissolved over low heat. Warm the syrup when you are ready to fill the jars. Optional – ½ tsp each of Tartaric Acid and Citric Acid for each jar to help preserve the fruit. Chop the citrus into chunks, pop them on some baking paper in a large roasting pan and sprinkle over the herbs and spices. Slow roast them in the oven at 130C (260F) for four to five hours. It will look a bit like a baking disaster but never fear, it’s all good. Allow to cool and then split the citrus pieces and herbs roughly evenly into the sterilised jars. Add the Tartaric and Citric acid, fill with warm sugar syrup, seal and wait for one month. This is the hardest part. Spoon the syrup and a piece of citrus into your glass and add sparkling wine, gin and tonic or just plain sparkling water for a mocktail. Unless you like crunchy spices in your drink I would suggest leaving them out. Eat the sozzled piece of citrus when you have finished your drink. Notes: This makes a very sweet, unctuous syrup which can be diluted. The citrus pieces will probably only last for a few drinks after which they will become a bit soggy and you’ll need to throw them out. Prolong the life of the syrup by storing it in the fridge. Warning: This is completely deadly when combined with alcohol – so be careful!